Royal Holloway College has been around for some time. The Egham campus was founded in 1879 by the Victorian entrepreneur and philanthropist Thomas Holloway. Royal Holloway College was officially opened in 1886 by Queen Victoria. 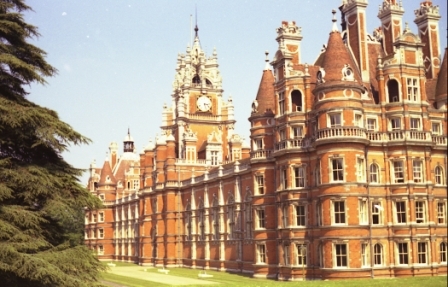 Royal Holloway College became a member of the University of London in 1900. In 1945, the college began admitting male postgraduate students, and in 1965, male undergraduates. In 1985, Royal Holloway College merged with Bedford College (another formerly all-women's college in London which was founded in 1849 and, like Royal Holloway College, joined the University of London in 1900 and became fully co-educational in 1965). The merged college was named Royal Holloway and Bedford New College (RHBNC), this remaining the official registered name of the college by Act of Parliament. The campus is dominated by the Founder's Building, a Grade I listed red-brick building modelled on the Château de Chambord in the Loire Valley, France. Thomas Holloway was the founder of the College. In 1871, Holloway had initiated a public debate through the pages of The Builder, inviting suggestions as to `How best to spend a quarter of a million or more', a sum of money that he very soon doubled. In fact, it was his wife who was to suggest a college for women as the means by which Holloway's money might effect what, in his own words, he wanted to achieve: `the greatest public good'. The architect of the College, William Henry Crossland, had been selected by competition to design Holloway's first great philanthropic enterprise — the Sanatorium at Virginia Water, begun in 1873 and opened in 1885. Holloway was much involved in determining the style of the new College, finally settling for a flamboyant interpretation of the French Renaissance. Inspired largely by the early 16th Century Château of Chambord in the Loire Valley, the College is built around two very large quadrangles. It impresses as much by its bulk as the exuberance of the roof-line, the whole building much enlivened by the contrast of white Portland stone with the predominant red brick. As solid as it is extravagant, it stands now as a monument to the wealth, optimism and spirit of philanthropy which so characterized the Victorian age. 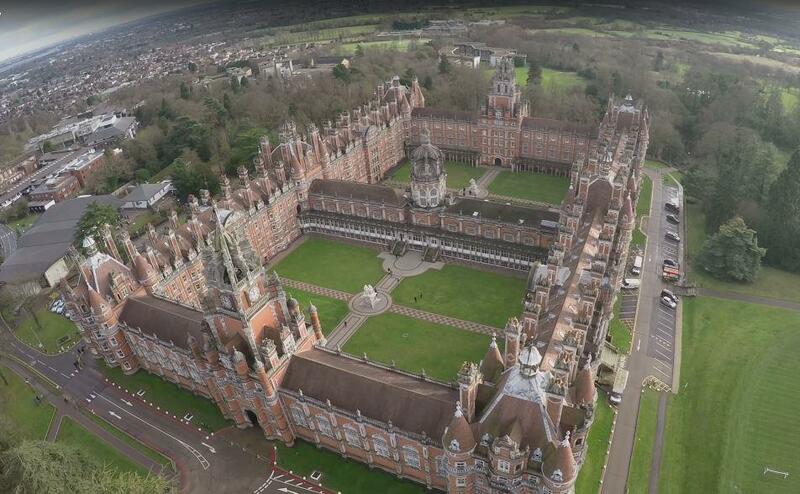 Royal Holloway's campus in Egham is set in 135 acres (55 ha) of woodland, between Windsor and Heathrow. Around 200 species of shrubs, 150 different types of tree and numerous wild flowering plants can be found in Royal Holloway's parkland. Why register on the site? The value of registering of the site depends on who you are and what you are interested in achieving. Registration will provide access to more areas of the website and allow you to contribute articles and comment on existing articles. For alumni from the period 1965-1985 registration will give you access to the biggest collection of memorabilia from the time. There are over 1000 pictures taken during the 70s (when cameras were much rarer than they are today) and we hope the site will encourage many others to dig out some old pictures and submit them. The site will also enable you to catch up and communicate with other alumni who have registered on the site. Only alumni will get to see all the pictures from the time since the purpose of these is to help rekindle memories of contemporaries and hopefully encourage you to reestablish contact. 1. An email will be sent to the email address you provided when you registered. You will need to click on this to activate the account. At this stage your application will be reviewed and the details you’ve provided will be checked against the alumni register. 2. If your details are the same as a name in the alumni register you will get approved and will receive another email telling you that you have full access to the site. This may take a little time as it’s a manual process. 3. If your details are not the same as in the alumni register but you are asking to register as alumni then you may get some emails asking you for more details or you may be asked to register as alumni with the college. 4. If you are not an alumnus your request for access will be considered and you’ll get an email either giving you greater access or requesting more compelling reasons why access should be granted. Welcome to a website for the ever older alumni of Royal Holloway College who were not only students at this fantastic college at some point between 1965 and 1985 but also remember, if only vaguely, what a wonderful time they used to have. In 1965 male undergraduates were admitted to the College for the first time - a group known as the pioneers. In 1985 the College merged with Bedford College and started a period of rapid expansion Between these two dates was a unique period in the College's history (at least for those that were there at the time) and this website celebrates those twenty years. So why is this website called RHC70s? When it was first conceived (and the domain name acquired) it was primarily to address just the 70s but as with most of our waistlines there was a gradual expansion to encompass those from 'just before' and 'just after' the 70s and then it expanded further to span the period between the two big landmarks in the College's history - and RHC70s has remained the easiest way to encompass that without having a ridiculously long domain name. Royal Holloway College (“RHC”) used to be a small college (less than 1000 students) located in Englefield Green, Surrey and an insignificant part of the University of London. The College is located on its own magnificent campus close to Windsor Great Park; the campus was dominated by the magnificent Founders building surrounded by parkland. The College was opened in 1886 by Queen Victoria having been commissioned by Thomas Holloway and built to model a French chateaux. In 1900 the College was admitted into the University of London. For its first 80 years it was a women’s college but in 1965 the first male undergraduates were admitted and in 1985 RHC merged with Bedford College (another small component of London University) and adopted the extended acronym of RHBNC. The college has since continued to grow to become the fourth largest college in London University. 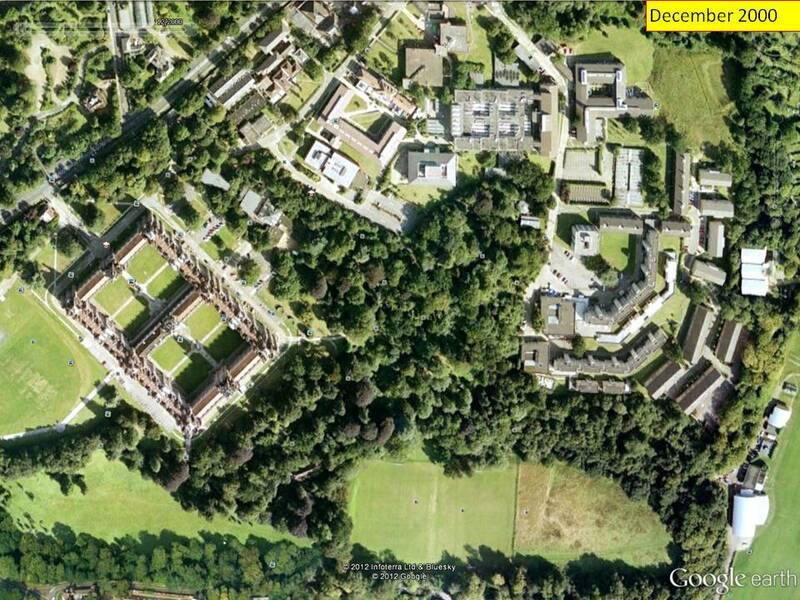 The aerial picture (thanks to Google Earth for that) shows the campus as it was in 2000. The "old" Cameron, Athlone and Williamson halls of residence were still standing. This picture will be replaced as soon as one from the '65-'85 period can be found. Other than the Founders Building and Athlone, Cameron and Williamson Halls most of the buildings shown have been erected since the Bedford merger. For those privileged to have spent some of the most formative years of their lives there the college will always hold fond, but sadly, increasing vague, memories of the campus, its buildings and the ever changing community of the student body. This web site will hopefully appeal to those racing towards dementia who now require the occasional memory jogger to recall that they too were once young. To help maintain the dignity of the aging alumni, areas of the site featuring memorabilia require registration. If you were a student at RHC at any time between 1965 and 1985 then please download the registration guide (available by clicking on the link above the main menu) and go through the registration process. Registration involves a manual stage to check that your name appears on the alumni lists so please follow the guidelines to make this as straightforward as possible. Thomas Holloway was a self-made multi-millionaire whose fortune had been made in patent medicines. He founded Royal Holloway College in 1879 after initiating a public debate inviting suggestions as to 'How best to spend a quarter of a million pounds or more'. It was his wife Jane who suggested a college for women as the means by which Holloway's money might effect 'the greatest public good'. Holloway's first great philanthropic enterprise, the Sanatorium at Virginia Water opened in 1885. The second, Royal Holloway College, largely inspired by the Chateau Chambord in the Loire Valley, was opened by Queen Victoria in 1886. Built around two quadrangles, today it continues to impress as much by its size as by the exuberance of the roofline with its many towers and turrets. As solid as it is extravagant, it epitomises the wealth, optimism and spirit of philanthropy so characteristic of the Victorian age. It continues to provide a home for the the Royal Holloway Collection - a Picture Gallery of Victorian paintings by Millais, Frith and Landseer among others - that was the final touch to Holloway's generous endowment. In 1900 Royal Holloway was admitted as a School of the University of London, when it was constituted as a teaching university. Today, the University of London is made up of 19 institutions and offers the widest range of higher education opportunities in Britain. Royal Holloway admitted male undergraduates for the first time in 1965, but the commitment to women's education remained. In 1982 partnership Agreement between Royal Holloway and Bedford College, signed as a result of severe cuts in government spending on higher education, paved the way for the merger in 1985. The newly merged Royal Holloway and Bedford New College was inaugurated in 1986 by Her Majesty The Queen as a ceremony in the College Chapel. The merger provided more academic diversity and strength as well as greater financial security. It also preserved the pursuit of innovation and excellence which characterised the Founders of the two parent colleges. 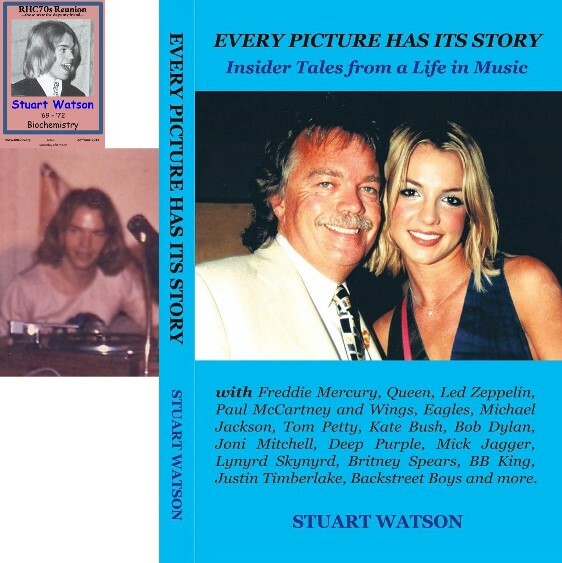 Click image for "Founders from the Sky"
Many of you who were around in the late 60s and early 70s will remember Stuart Watson who was Social Secretary while he was a student. You'll find a number of photos of him on the site -two of them are reproduced here along with the cover from his new book. The book includes some pieces about his early years at Royal Holloway that some of you will find interesting.